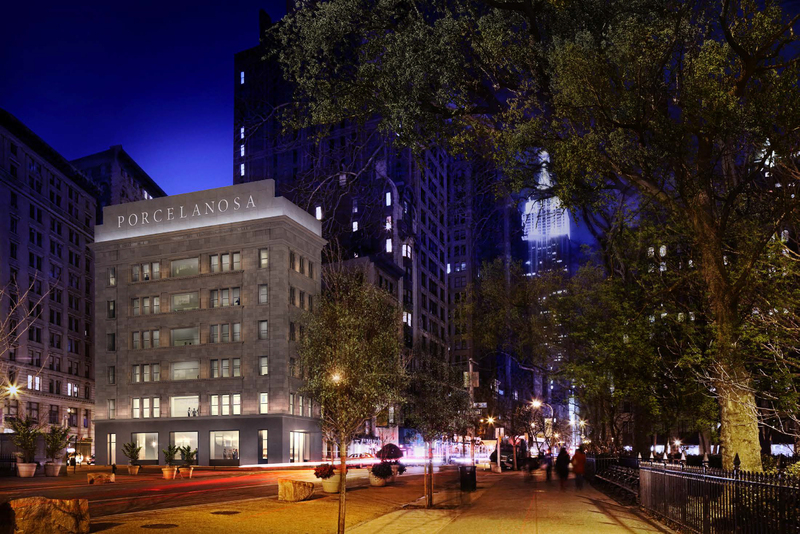 The building, known until recently as the Commodore Criterion, is to be renamed the Porcelanosa Building, and will become the company’s new flagship store in New York. 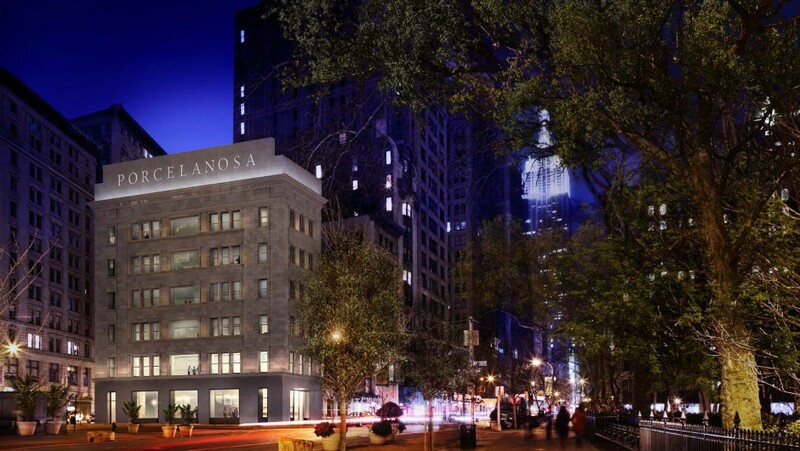 Located in the privileged enclave of Manhattan, at the junction of Broadway and Fifth Avenue with 25th Street, the new Porcelanosa building is situated just opposite the Flatiron Building, next to Madison Square Park. The 1,500 square metres, six storey building was designed by the architects Ely Jacques Kahn and Albert Buchman in 1918. Previously the site was occupied by a brownstone built in 1857 which variously housed the headquarters of the New York Club, the Madison Square Bank, the fledgling Cosmopolitan magazine and the Berlitz reputable language school. The current building was constructed during the First World War and for an extended period was the headquarters of the General Outdoor Advertising Company. Later, it was renamed the Gilbert Hall of Science and became the premises of the toy company, A,C, Gilbert. A,C, Gilbert Company was manufacturer of the first model construction kits, popularly known as Meccano, together with chemistry sets and telescopes. Hundreds of onlookers were attracted to the building’s row of circular windows overlooking 25th Street, to watch the model trains which ran inside. Its founder became a legend when he managed to convince the Council of National Defence not to halt manufacture of educational games at Christmastime during the Second World War. Faced with the request from the Council to concentrate all production on manufacturing arms during the War, Albert Gilbert argued that the children playing with the toys were their future engineers and architects – even getting members of the Council itself to try out the model construction kits, which was the inspiration behind the film “The man who saved Christmas”. In later years, the building was occupied by various toy and Christmas decoration companies. Until quite recently in the store window you could see a scaled display of the building’s more famous inhabitants. In a few weeks, the building will be reopened as Porcelanosa Building, after a deep renovation process by architecture study Foster and Partners. The architectural practice Foster and Partners completes the superb refurbishment of the new Porcelanosa Building in Manhattan. The early twentieth century, neoclassical façade of the new Porcelanosa flagship store in New York conceals the extensive refurbishment which has completely transformed the interior. The work by one of the most outstanding architects of our times has created a contemporary contrast typical of more avant-garde buildings. In line with the protected status of the building, Foster and Partners have refurbished the façade, reinstating the original design, relocating the main entrance on Fifth Avenue and restoring the old openings to allow natural light to flood the interior. The transformation of the building’s interior has created a fluid scheme, opening up the different floors to ensure a dynamic interrelation between the different levels. The building’s six floors will accommodate exhibition areas and offices, in addition to flexible expansive areas for conferences, presentations and workshops. During the entire refurbishment process, the British architects have put particular emphasis on maximising efficiency and sustainability of the building, which aspires to LEED Gold sustainability certification. In addition to recycling much of the construction waste, a highly insulating external envelope has been devised which will reduce carbon emissions by 50%. locate ip Systems for natural cooling and 40% reduction of water consumption have also been installed. On this basis, the new PORCELANOSA store in New York will be an eco-friendly, innovative and versatile building; its historic exterior combined with an impeccable interior design approach.